I have always wanted to do a LEGO piece. The Nerd Stalker gang just got word from our friends at btrax of a special guest attending the Global Mobile Internet Conference starting tomorrow- October 19-20. President Obama. Well, almost. 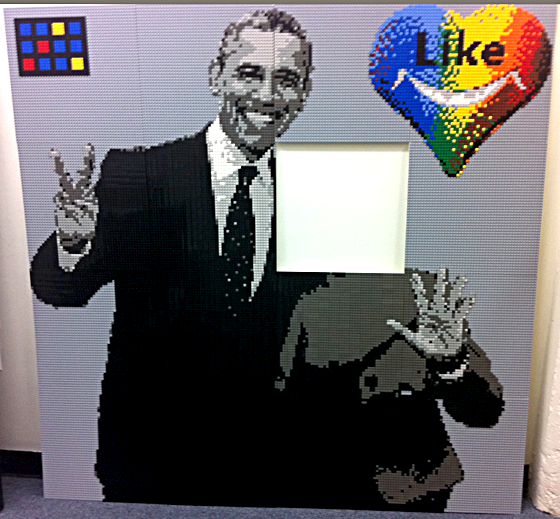 Inspired by the GMIC-Silicon Valley theme “CONNECTING GLOBAL INNOVATORS”, Like Cam is bringing the largest LEGO portrait likeness of President Obama (1.5m x 1.5m) to the GMIC-SV conference. The LEGO piece was created by John Takaoka and John's lovely daughter-Lily, to commemorate the launch of the iPhone app "Like Cam". Like Cam is an app for the iPhone that allows users to decorate pictures with smiley faces or other stamps. The developer of "Like Cam" wants all the conference attendees to download the app, take a picture of it, decorate it with Like Cam and then share it on Facebook and/or Twitter. Check it out! Imagine your mug right next to the president. Get 50% discount tickets here for the GMIC Conference.